5 x 1.5 x 4.5" 6.5 x 2.5 x 9" 5 x 2 x 11" 8.5 x 3.25 x 14" 3.5 x 2 x 24" 5.25 x 3.25 x 20"
2000 pack Carton Natural Portion Bag 5x1-1/2x4-1/2". These bags are grease resistant, unbleached natural kraft paper. Biodegradable, compostable and recyclable packaging. Green Way® Eco-Friendly Packaging. Complies with FDA regulations for food packaging. Made in the USA. Our 100% biodegradable and compostable Natural Portion Bags come in two styles. Choose from natural kraft portion bags or green swirl bags with clear polylactic acid (PLA) window. Both styles are unbleached grease resistant natural kraft. Complies with FDA regulations for food packaging and ASTM D6400, EN13432 standards for CA and other states. 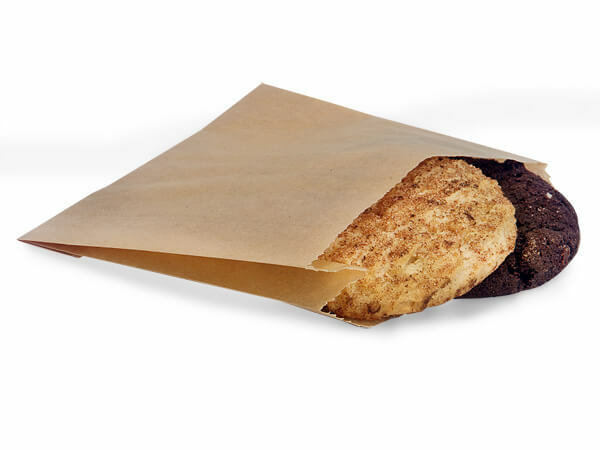 These compostable bags are great for sandwiches, bakery items and more!